CHEF: Gary Pickles in Martha's Kitchen at the Tap & Barrel. A PONTEFRACT town centre pub has pulled off a culinary coup by securing a Michelin star winning head chef. 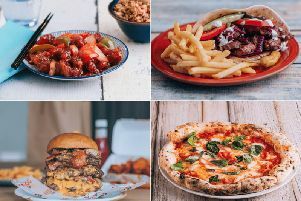 Gary Pickles, who has worked under world-famous chefs Marco Pierre White and Gordon Ramsay and starred on TV with Michelle Roux Jnr, is promising to take pub grub to a new level at the Tap & Barrel on Front Street. The 35-year-old, who has gone into partnership with friend and landlord Dean Smith, is originally from Leeds but now lives in Pontefract. Gary trained at The Box Tree - Ilkley’s Michelin star restaurant - working under head chef Simon Gueller and part-owner Marco Pierre White. He spent six years working for the Gordon Ramsay Group at Claridge’s among others. As head chef at Bella Luce in Guernsey he guided the restaurant to its first Michelin star. The new venture has been namwed Martha’s Kitchen after a 17-year-old member of staff, Martha Smith, who will be working closely with Gary.